A vocologist is any person who habilitates vocal behavior - a speech-language pathologist, otolaryngologist, singing teacher, or voice coach. Vocology has evolved recently from inter-relationships between speech science, medicine, theater training, and vocal pedagogy. It is not widely taught in academic institutions as an independent discipline. 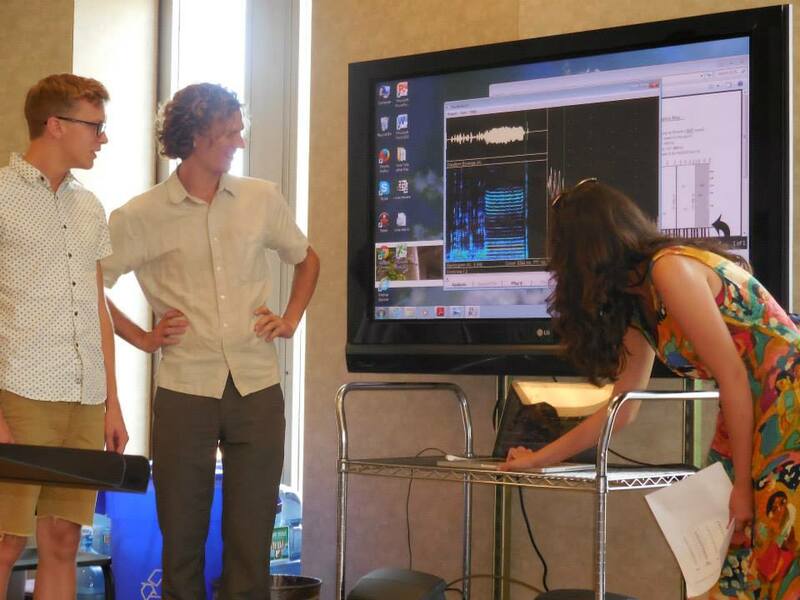 At the present time, only The University of Iowa has a formalized curriculum in Vocology, which is taught as a specialty track in speech-language pathology. The Bodymind and Voice course continues a 30 year tradition of presenting materials that are on the cutting-edge of vocal/choral education, geared toward choral professionals. The understanding of the human system is exploding with recent developments in technology and neuroscience. This course introduces a radically new way of scaffolding voice training away from parts manipulation. They mirrors research in motor learning and skill acquisition with athletes and applies these insights to voice training. The material is presented in a practical, accessible and engaging approach that models the science it is based upon. Science describes what is. When we teach according to the way the human system works, teaching becomes efficient and effortless and voices remain healthy. This five-day seminar provides an opportunity to attend engaging, thought-provoking presentations on vocal acoustics and psychoacoustics, master classes in its pedagogic application, and tutorials in technology for studio and research use, while giving you ample remaining time to process course content, engage in follow up discussion with participants, and observe or take lessons with the course instructors. voice therapists specializing in the rehabilitation of singers. Westminster’s Voice Pedagogy Institute is a focused, intensive program for trained singers who are or wish to become voice teachers, and for voice coaches. Fact-based teaching with practical applications of voice anatomy/physiology and acoustics, vocal health with voice-centered laryngologists, technical work in both Classical and Musical Theater genres, Yoga as it applies to singing, interactive look-in lessons with master teachers, and hands-on use of the Presser Voice Lab are all part of this fascinating week. This year there will be an add-on option of an additional day for more extensive hands-on laboratory work. Join us if you desire a more complete understanding of voice pedagogy (modern and traditional), a more confident approach to voice science, and more experience with voice technology. ​Fulfillment and reward are achieved through self-improvement and personal growth. Before you can successfully take steps towards positive change, it is important to understand who you are, what powers you, and to recognize the self-imposed limitations that are holding you back. If you want to live a life fuelled with passion and purpose, the time to begin is now. Come experience your full, uninhibited potential! ​This new installment of THE VOICE INCORPORATED series will delight and surprise, reveal and re-educate. Each 4-class series will have a different theme, but together they will give a total picture of the body/voice/brain connection – from broad strokes to delicate details and everything in-between. Each class will include a simple, but potent introduction to essential functional anatomy, an experiential integration lesson, discussion and more… And, online, you can experience this all from the comforts of your own home! To make it even easier, each class will also be recorded and archived, so if you cannot attend live, you can watch the classes later, in your own time. and benefit troubled voices. This is a four-day intensive class in which lectures alternate with small-group sessions on vocal technique. The small group sessions are unique to our program. In a safe, supportive atmosphere, participants learn the fundamentals of the McClosky Technique thoroughly, so they can "take it home with them" and continue their work. For most participants, this is the heart of the program, where they begin to hear changes in their own voices and in the voices of the other participants. Common Voice Disorders: A review and discussion, usually with an M.D. ​The Vocal Pedagogy Professional Workshop (VPPW) is designed to provide collegiate and private voice instructors and vocal music educators with unique learning opportunities in both musical theater and classical voice pedagogy. Participants who complete the workshop will receive a Boston Conservatory at Berklee Certificate of Vocal Pedagogy Professional Workshop. In addition to earning 18 Professional Development Points (PDPs)*, participants will leave with an enriched and functional understanding of the anatomy and physiology of the singing mechanism, knowledge of current developments in voice pedagogy and speech science, and a systematic practical approach to both classical and musical theater technique. The Institute will be an exposé and application of the principles discussed in "The Naked Voice: A Wholistic Approach to Singing" by W. Stephen Smith (Oxford University Press, 2007) for singers and voice teachers. For the singers it will include private lessons, master classes, acting classes, dramatic coachings, and a performance of opera scenes. For the teachers it will include five two-hour seminars on voice technique and pedagogy in a lecture/master class format along with the opportunity to participate in acting classes and to observe the singers' private lessons and master classes. Lessons, master classes, and seminars will be taught by W. Stephen Smith. Acting classes, dramatic coachings, and scene staging will be by Gene Roberts. Singers should have completed at least three years of collegiate level training. Teachers should have collegiate level voice teaching experience. Space is limited to 10 singers and 10 teachers. · OVERVIEW OF VOCAL FUNCTION - Solidify your understanding of the anatomy and physiology of the vocal mechanism and explore functional concepts hands-on with our experienced faculty. · BELTING - Learn how the vocal folds function when belting and techniques for training belters and aspiring belters. · MOTOR LEARNING - Explore how singers acquire new skills and techniques for achieving lasting results with greater efficiency. · EXERCISE PHYSIOLOGY - Design strength-training exercises for the voice based upon principles used by athletes. · VOCAL HEALTH - Establish parameters for CCM singers and learn how to use a variety of semi-occluded vocal tract exercises, with emphasis on protecting the vocal health of CCM singers. · SMALL GROUP SESSIONS: Participants will also have hands-on experiences with the CCM faculty in small groups that allow for deeper exploration of the concepts. Session I material will be presented through lectures, demonstrations, and master classes. Recommended Texts: "The Vocal Athlete" and "The Vocal Athlete: Application and Technique for the Hybrid Singer" by Dr. Wendy LeBorgne and Marci Rosenburg; "Your Voice an Inside View" by Dr. Scott McCoy; "So You Want to Sing Rock 'n' Roll" by Matthew Edwards. Teacher Training, Lisa is a certified instructor for the singing teacher-training course, Be A Singing Teacher! It is recognized by the teacher network, Vocology in Practice (VIP), as a training course to help teachers qualify to become an authorized VIP teacher. Experienced teachers also take this course to refresh their knowledge and to identify areas they want to develop more deeply in their pedagogy and teaching style. -in search of a well-rounded introduction into teaching the singing voice? -hitting the proverbial brick wall with your current knowledge/skill? -not sure how to start your teaching business? -looking for a well-sourced, structured and highly relevant singing teacher training programme? -interested in teaching in a non-classical vocal style? -hanging out to meet other like-minded singing teachers? -keen to train as a singing teacher but not in a specific methodology? Well, BAST Training to the rescue! We can help you gain the knowledge, skills and understanding you require to be a great singing teacher. How do we know? Because we have over 400 singing teachers who have attended our singing teacher training 20 hour course or live events, and they have told us so! In this course, you will learn several powerful ways to deal with Acid Reflux that you can use with yourself. Some involve hands-on techniques, others utilize movement lessons based on Feldenrkais® Awareness Through Movement Lessons and Tellington TTouch® self-care. You will also learn about the essential biology and chemistry involved in how Acid Reflux works and how we can influence it as a process. You will learn about the role of food & nutrition in achieving your optimal health. Elinor’s personal and down-to-earth approach makes this often complex subject easy to understand, fun to learn about and deeply relevent to your own experience. Her gentle practical interventions will bring a new balance to your digestive system and overall well-being in a restorative way. Welcome to The Singing Athlete, a four-day course taught by Andrew Byrne. Through a combination of instruction, group exercise and individual master-class sessions, you will learn secrets of elite vocal performance that I have adapted from the world's best athletic trainers. Along the way, we'll be exploring new ways to harness the power of your body and your nervous system to bring your singing to new levels of ease and mastery. The Vocal Instrument 101 delivers Phonation, Respiration, Resonance, and Registration ONE-OH-ONE in short, easily digestible, immediately applicable, and humourous (because: anatomy and physiology can be fun: #pinkyswear!) chunks that you can watch at your leisure (or at your work; that’s entirely up to you and I’m not judging so …)! If you’re an independent voice teacher who wants to teach your face off EVEN HARDER THAN YOU ALREADY DO?! This is the course for you. John Henny has created some of the leading online study courses for teachers and singers. Voice Teacher Boot Camp - The first and only online teacher training course. Learn to diagnose voices, how to setup your studio, vocal anatomy and acoustic science, piano skills and more! This course can take you from never having taught a lesson to being a top-notch voice teacher. The New Science of Singing - Designed for singers who want to know how their voice really works. You will get more out of your lessons and practice sessions by knowing why you are doing certain exercises, and how to fix vocal imbalances yourself. The Science of Vocal Bridges - Learn the science behind this most difficult vocal area. Designed for voice teachers and advanced singers, this course breaks down the acoustics of vocal registration. The course includes tons of resource materials including anatomical images, videos, and other links. Each module is about 20 minutes long and the entire course is go-at-your-own-pace. If you’re eager to learn quickly, you can do one module per day and complete the course in a week. However if you like to take your time to think and absorb, you can do one module per week and complete the course in two months. It’s up to you, but since we all often need a nudge, you can set up email reminders to keep moving forward. When you enroll, you’ll become part of my online community where you can ask your questions about the course and vocal health. I also host regular online Q&A chats you can attend as well, and additional courses on topics including presence, energy, mindset and habits, breathing, and delivery. You’ll be the first to have access to those classes as they come along, and bonuses as they’re added to the course. ﻿﻿﻿What will your Professional Development Webinars do for me? Tom Burke is a speech pathologist and voice therapist based in New York City where he provides voice training and rehabilitation services to professional singers and actors in the film, TV, music and Broadway industries. His work has been featured on MTV, The Oprah Winfrey Network and HBO. In addition to offering a regular video blog series, “Technique Talk Tuesday,” and “Audition E.R.” he developed an online voice training program, “Book It! Online,” which provides New York quality voice training to clients around the world. As a “Story Doctor” he has coached for Google since 2007 working with several teams including: Google’s Large Advertiser Marketing team, Google Plus and the “Learn with Google Webinars” team. He also coached executives for large externally facing marketing events such as: Google Think Events, Learn Events, Adwords Performance Forum, Creative Sandbox and Google’s Executive Partner Summit. With each passing year, Tom is increasingly converting more of his model to virtual coaching. This new model has allowed Tom to finally pursue dreams of traveling internationally and balancing work, life and performance opportunities. A self proclaimed “artistpreneur,” Tom is interested in coaching other like-minded thinkers in the worlds of medicine, marketing, technology and the arts share their voice and vision with the world. As a result, he is currently developing the “EAGR” program:”Empowering Artists for Global Reach” through free and readily available technology. Tom Burke, MS CCC SLP received his Master of Science degree in Speech-Language Pathology at Loyola University of Maryland. He has trained in several voice and bodywork traditions including Yoga, functional movement, Alexander technique, Fitzmaurice Voicework, Lessac-Madsen Resonant Voice Therapy and others. He is a proud Certified Course Instructor of Estill Voice Training.